Secret audio-recordings of wireless transmissions or direct recordings via digital-recorders most often need to have an after-treatment. This especially is necessary in cases where noises from surrounding sources are detrimental. Such unavoidable – but yet disturbing sounds – might be created by air-conditions, traffic, wind or any other noise-creating engine. We, PKI, as a leading manufacturer of surveillance systems hereto can offer a perfect solution to this problem, namely our PKI 2500 Noise Filter System. With this device every department worldwide – like police, secret service or any other state-owned organisation – is able to restore and enhance such poor quality recordings. 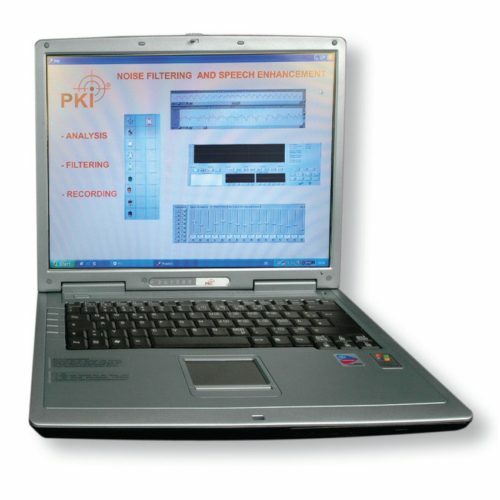 PKI 2500 is based on a special software solution for filtering of noise-corrupted sound recordings.